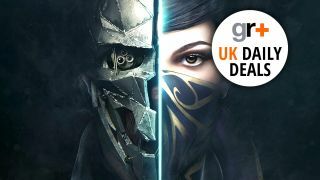 This week Dishonored 2 finally arrives and, if you're thinking of picking up a great deal, then you're in luck. There are a few cheap options on both PS4 and Xbox One if you want to save some money. As far as bundles go, then if you were thinking of picking up a PS4 Pro then there are some options that pack in a lot of extra games and stuff, as well as Dishonored 2. They're pricey but the value for money is high. Sadly, Xbox One doesn't have any notable Dishonored 2 specific bundle deals so you'll just have to make do with the game. Take a look below at the options and see if anything takes your fancy. Dishonored 2 on PS4 £40 at Tesco. Dishonored 2 on PS4 featuring Imperial Assassins pack £39.99 at Zavvi. Dishonored 2 Limited Edition including Dishonored Definitive Edition on PS4 £44.99 at Zavvi. PS 4 Pro 1TB with Dualshock Controller + Wireless Headset + Dishonored 2+ Infinite Warfare & NOW TV 3 Month Entertainment £489.99 at GAME. PS 4 Pro 1TB with Wireless Headset, Dishonored 2, Call of Duty Infinite Warfare and NOW TV 3 Month Entertainment Pass £449.99 at GAME. PS 4 Pro 1TB 1TB Console with The Division + Fallout 4+ Dishonored 2 and NOW TV 3 Month Entertainment Pass £399.99 at GAME. PS 4 Pro 1TB Pro 1TB Console with Dishonored 2 and NOW TV 3 Month Pass £369.99 at GAME. Dishonored 2 on Xbox One £40 at Tesco. Dishonored 2 on Xbox One featuring Imperial Assassins pack £39.99 at Zavvi. Dishonored 2 Limited Edition on Xbox One including Dishonored Definitive Edition £44.99 at Zavvi. Looking for the best price on a standalone PS4 Pro console? Check out our best PS4 bundle deals guide which is regularly updated with the latest PS4 and PS4 Pro bargains for standalone consoles and bundle deals in the US and the UK. If you're after the best price on an Xbox One then check out our best Xbox One bundle deals guide which is also regularly updated with the latest Xbox One bargains for standalone consoles and bundle deals in the US and the UK.